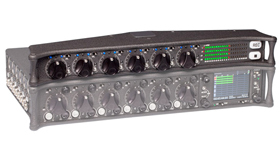 The SL-6 offers built-in NP-1 battery powering for the 688 mixer, slot receivers, plus four additional DC outputs for external peripherals, as well as built-in antenna distribution. 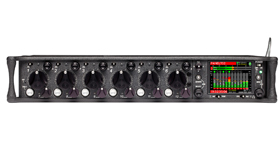 Using Sound Devices’ proprietary SuperSlot™ interconnection standard, the SL-6 offers all powering, audio interconnection and control needed for SuperSlot-compatible receivers.The SL-6 features two power inputs: NP-1 battery and external DC. The SL-6, its attached receivers, the 688 (and CL-6, if connected), and any devices powered from the SL-6 DC outputs require one of these power sources to operate. When both SL-6 power sources are depleted or disconnected, the SL-6 PowerSafe™ battery will keep the SL-6 and attached devices powered for 10 seconds while recording is stopped. If any power source is attached to the 688’s external DC input, or if internal AA batteries are present, the 688 (and CL-6, if attached) will continue to operate using those power sources.